Janice Corinne Worsley Mayberry, age 91 of Rocky Mount, passed away on November 18, 2015 at The Fountains at The Albemarle. Janice was born on November 7, 1924 in Rocky Mount, NC. to the late Callie Ruffin Worsley and Paul Raymond Worsley. Mrs. Mayberry was President of Worsley Farming Company. She graduated from Rocky Mount High School in the Class of 1942 and from Mary Washington College of the University of Virginia in 1946. She was a life-long member of the First Presbyterian Church of Rocky Mount and served three terms as an Elder. 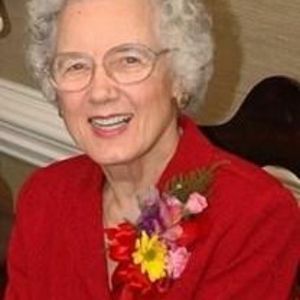 She taught Sunday school for a number of years and was active in the work of the Presbyterian Women and was recognized by the First Presbyterian Church in 2012 with its Older Adult Award. Mrs. Mayberry was a former member of the Board of Trustees of Braswell Memorial Library. She was also a charter member of the New Horizons Book Club. She is preceded in death by her husband, Walter Linzy Mayberry, Jr.; her brother, Charles Creighton Worsley; grandson, Charles Ruffin Mayberry, II and a special cousin, Carlyle Gay of Tarboro, NC. She is survived by her loving family, which includes; Walt Mayberry and wife, Kay of Portland, OR. and their children, Amy Mayberry of London, England and Ben Mayberry of Seattle, WA; Charles Mayberry and wife, Nancy of Johnson City, TN; and their son, Jack Mayberry and wife, Jamie, and their son, Jack of Knoxville, TN; Wade Mayberry and wife, Pam of Annapolis, MD; Paul Mayberry and wife, Teresa of Annandale, VA. and their son, Warren Mayberry and wife Amie and their son, Landon of Arlington, VA; son, Reid Mayberry of Philadelphia, PA. and son, Davis Mayberry of Annandale, VA; nephews, Danny Worsley of Ocracoke, NC; and Tommy Worsley and wife, Patti of Myersville, MD. The family will receive friends on Sunday, November 22, 2015 from 3:00 PM until 5:00 PM. in the chapel at Johnson Funerals and Cremations, 661 English Road, Rocky Mount, NC. 27804. A Funeral service will be held on Monday, November 23, 2015 at 11:00 AM in the chapel of the funeral home, with burial to follow in Pineview Cemetery. In lieu of flowers, memorials may be made to the First Presbyterian Church, 153 N. Church Street, Rocky Mount, NC 27804; Braswell Memorial Library, 727 N. Grace Street, Rocky Mount, NC 27804; or to the Class of ‘42/Kate Parks Kitchin Scholarship Fund, c/o Triangle Community Foundation, 324 Blackwell Street, Suite 1220, Durham, NC 27701.